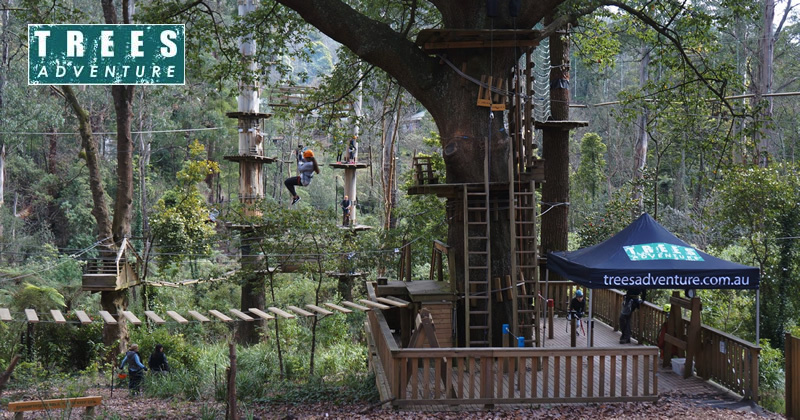 Our parks feature exciting and challenging obstacle courses high up in the tree canopy, that will have all the family swinging, leaping, climbing and flying through the forest - allowing thrill seekers and nature enthusiasts to experience the trees like never before! Our sessions run for 2 hours (including training) from 4 years and up meaning there is different course for the whole family to enjoy! Trees Adventure Lane Poole Park is located 100km from Perth, near Dwellingup at Lane Poole Reserve. The township of Nanga was once a thriving timber town established in 1909, but was forced to close during the First World War and then in later years, suffered from bushfire disaster. Today you may still be able to see some of the remnants. Our treetop courses are built around the beautiful Pine and Jarrah trees of Nanga Mill Campground, with exhilarating views as you flying fox through the treetops or quickly stop to catch your breath in the middle of one of our suspended bridges! This obstacle course is the adventure you've been waiting for. There is even an airborne skateboard! All Year Round	Last Session: 3pm.